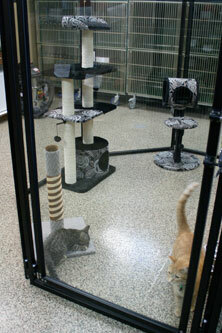 Cats love to climb and explore so we have penthouse climbers in four of our suites. 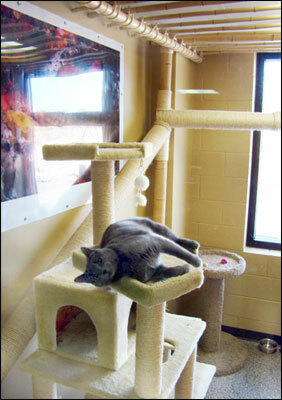 Penthouse suites are available for cat families or the cat that likes a little more room to stretch out. Your cat has the opportunity to explore the rest of the Lion's Den twice daily while we’re cleaning their Penthouse Suite. We have two Luxury Penthouses suites that are private, themed 8' x 8' rooms with sisal-wrapped catwalks, a big cushy chair, a jungle gym, a large window with an outdoor view and another window into the main room of the Lion's Den cattery. The other two Penthouses are enclosed in our Cat Atrium, a windowed enclosure with a solid divider wall and plenty of furnishings and toys for your feline to enjoy. 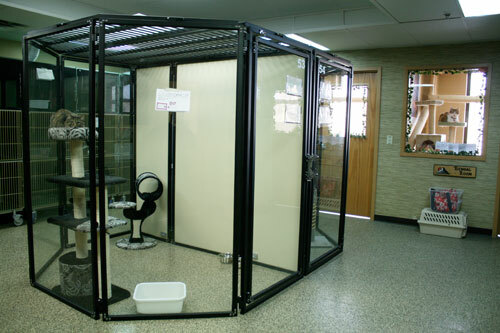 The Cat Atrium provides your cat with the most visibility of main room of the cattery.